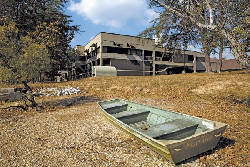 A boat is beached near the park inn at Fall Creek Falls State Park on Wednesday, Nov. 2, 2016, in Spencer, Tenn.
NASHVILLE — Tennessee Building Commission members late last week gave nods to hundreds of millions of dollars worth of new capital projects, including some $32 million for long-needed repairs, renovations or upgrades to facilities at long-ignored Tennessee state parks. Among the park projects approved Thursday was a $2.89 million plan for a new 4,800-square-foot visitor center for Fall Creek Falls State Park near Spencer, Tenn. The Tennessee Department of Environment and Conservation project includes demolition of the campground check-in station and business offices. Commission members approved moving ahead on the design phase and using a "best value" alternative delivery process to select a contractor. A designer for the project was chosen earlier. Officials said they need the alternative contractor-selection process to find a builder best suited to construct a sophisticated structure in a remote area with a high level of detailing, material interfacing and vaulted timber structures. Bids are expected in January with approval of the contractor to come back before the commission. Building Commission members also gave tentative approval to TDEC to proceed with a $10 million project at Henry Horton State Park near Columbia in Middle Tennessee. Work includes demolishing the existing visitor center and restaurant and building a new center and restaurant. Also approved was an $11.8 million project at Pickwick Landing State Park near Savannah in West Tennessee. That project includes renovating the inn, conference center, kitchen and restaurant. Commissioners gave a preliminary nod to the proposed $106 million renovation project for Neyland Stadium at the University of Tennessee in Knoxville. Phase I of the three-part project will deal with the south side of the stadium. The commission approved budget, scope, funding and sources of funding, and gave the university permission to proceed with selecting a designer. Yet another project given permission to proceed is a $43 million renovation of the historic John Sevier State Office Building near the state Capitol in Nashville. Members again opted to use the "best value alternative delivery method," and to use construction companies experienced in dealing with historical structures. The John Sevier building was constructed in 1939-1940 as part of the New Deal-era's Work Projects Administration program. The building has two large murals depicting "The Discovery of Tennessee" and "The Development of Tennessee," painted by artist Dean Cornwell. It now serves as home to the Tennessee Attorney General's offices.